A three star walkthrough for levels 11-20. 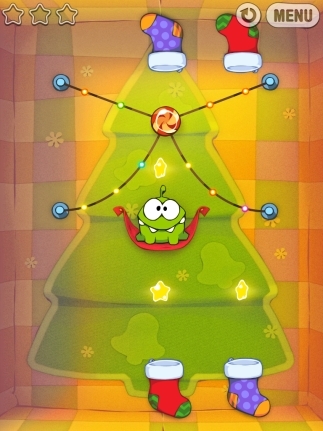 Earlier today we published Part 1 of our complete walkthrough for Cut The Rope: Holiday Gift. If you've already blitzed through the first ten levels, here are the complete solutions for levels 11-20. Swipe horizontally through both ropes with one gesture. The candy will drop into the right-hand stocking, then shoot up into a bubble from the left, grabbing the first star in the process. Pop the bubble just before it reaches Om Nom, and the candy will fall back into the stocking and up through the other, entering a new bubble and earning another star. 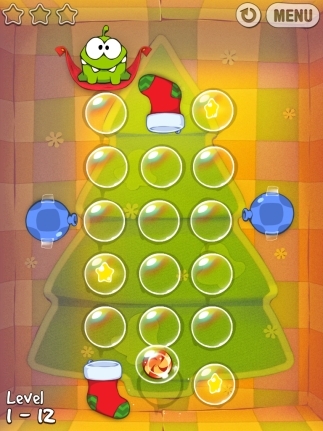 When the bubble is adjacent with the air cushion, tap it repeatedly to move the candy towards Om Nom and the remaining star. There are a lot of bubbles here, but don't panic! Let the candy rise up through the first column of bubbles and enter the stocking. 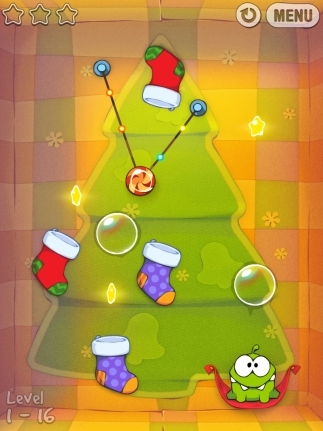 When it emerges from the other stocking, pick up the first star, then start tapping the left-hand air cushion to send the bubbled candy towards the star at the top-right of the screen. As soon as you've grabbed that, let the candy fall gradually through the bubbles until you've got the final star. Once the bubble has risen up to be adjacent with the right-hand cushion, tap on it to send the candy towards Om Nom. Swipe the upper left-hand rope to grab the first star. 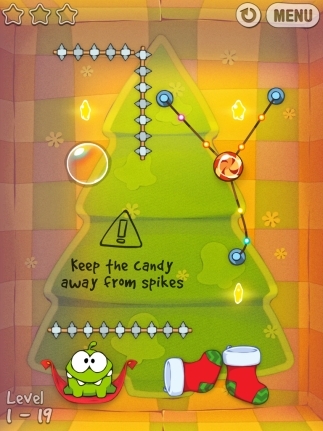 Once the candy has settled, swipe the upper right-hand rope to drop and collect the star in the middle. 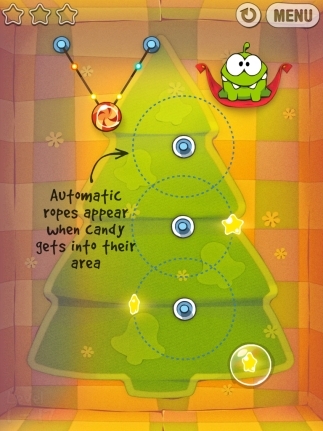 Now swipe both of the remaining ropes at the same time to send the candy on a stocking-fueled journey towards Om Nom. Tap the air cushion in time with the swinging candy so that it eventually reaches the star at the top-left hand corner of the screen. 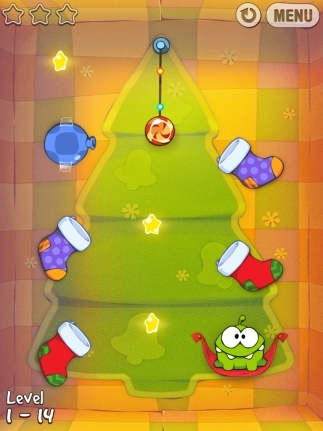 Once you've grabbed it, let the candy swing back towards the upper purple stocking, and cut the rope to drop it inside. From here, the candy will automatically go on a journey to collect the other two stars and finish up at Om Nom. Swipe through the left-hand rope. Now tap on the right-hand air cushion to swing the candy to the left-hand side. 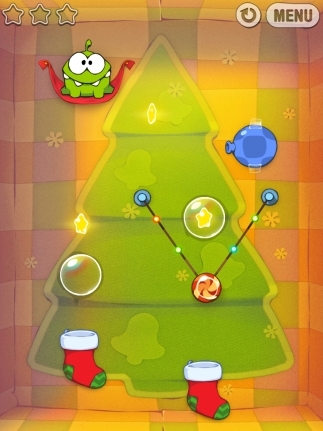 Cut the rope so that the candy falls in the left-hand red stocking. When it emerges from the other stocking, it will be enter a bubble traveling to the left. Use the left-hand air cushion to nudge the bubble back towards the center of the screen. Let it rise up until you've got the final star, then drop the candy into Om Nom's mouth. Cut the right-hand rope and let the candy swing towards the first star. Once you've grabbed it, cut the remaining rope to drop the candy into the stocking. When it pops out at the top of the screen, it will fall into another bubble and grab the second star at the same time. 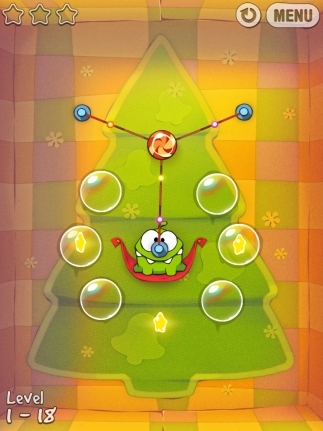 Pop the bubble to land in the purple stocking, and be shot out towards the final bubble. Let it rise up, grab the third and final star, then pop the bubble to send the candy to Om Nom. Cut the left-hand rope. Once you're automatically latched onto a new rope, cut the uppermost one. 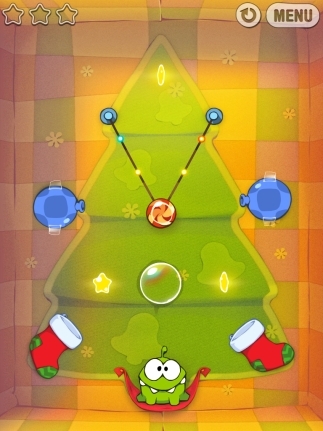 Work your way rapidly down the Christmas tree in this fashion until you've collected the first two stars, then make a well-timed swipe to drop it onto the final bubbled star. Now let it rise up so Om Nom can get his teeth stuck into it! Cut the left-hand rope and let the candy swing into the bubble. Pop the bubble, then make a well-timed swipe of the upper rope to drop the candy on the first star. Keep popping the bubbles so that the candy makes a complete, tethered orbital journey around Om Nom, picking up the remaining two stars in the process. Once you've bagged them all and the bubble's almost above Om Nom, pop the bubble to complete the level. Cut through the right-hand rope, then the lower rope and let the bubble rise up to grab the first star. Let it rise up to just before the dangerous spikes, then pop the bubble to have the candy swing right over to the left and into the second star. Once you've got it, cut the final rope to drop the candy through the final star, into the red stocking, and then out to Om Nom. Cut through the bottom-right, then both of the left-hand ropes. Once the candy has swung into position near the purple stocking, cut the final rope to send it on a journey through both sets of stockings. Here's the trick to this level. 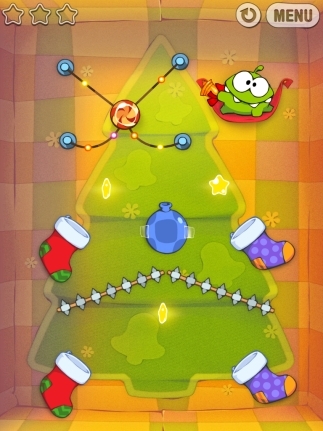 Once you've got the final star, let the candy make another circuit through the stockings, but when it arrives over the blue air cushion tap away to blow it towards Om Nom.